This a pretty useful origami box, it's long and the lid closes snugly and stays shut. This origami box would be perfect to keep your pens, pencils, sewing tools, chopsticks, jewelry or any number of other uses! You will need one sheet of square paper, we would suggest using thicker paper for this. Our paper was 21 x 21 cm and fitted my pens nicely, you could use bigger paper for longer pencils. 2. Get a ruler and pencil and mark your paper at the bottom 7 equal sections. 3. Now using the marks as guides, fold the paper into the seven sections. 4. This is the result. 5. Turn your paper so that the creases are horizontal. 6. Fold in all 4 corners. 8. Fold the bottom seventh in half. 9. Unfold the previous fold. 10. Using the corner crease as a guide, fold the left edge inwards s shown. 11. Take some time making this fold right. 12. Fold the left edge in the same way. 13. Unfold the right and left sides and flip the paper over. 14. You could use a pencil to lightly mark these lines, these are where we'll be folding. 15. Bring the bottom right corner inwards and align it to the horizontal creases and fold only where the line is on the other side. 16. Bring the top right corner over to the left and align it the same way, along with the horizontal creases in order to create the crease. 17. Fold all the other lines in the same way. 18. Flip the paper over. 19. Fold the bottom left corners in, followed by the section we folded in half earlier. 20. Rotate the paper and fold the left and right sides in. 21. Open out the box as shown. 22. Flip the bottom section into the top in order to form a box. 23. Continue collapsing the box by letting the box fold where the creases are. 24. Hold the box together while closing it. 25. You could add glue to make the box more sturdy. Watch an explanatory video on this model, here. 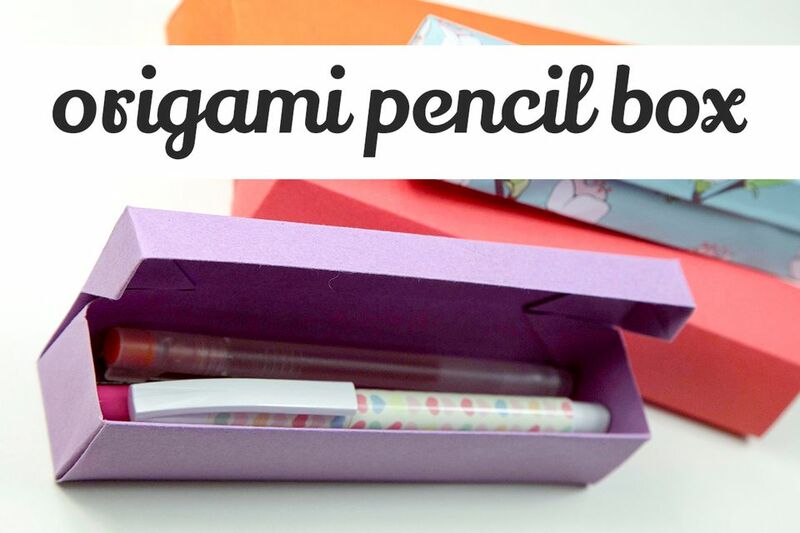 If you've made an origami pencil box, please tag #paperkawaii on Instagram so that we can see it! For more tutorials and also video tutorials, check out the youtube channel called Paper Kawaii, also check out some of the websites below if you like.